Hornet senior forward Anders Lee picked up where he left off from the grid iron, and that is in prolific fashion as he opened the 2008-2009 hockey season with an impressive 2 goal, 4 assist effort. His six points paced the Hornets in their opening night 11-4 win at the Wayzata tournament over Buffalo. Michael Sit (1g-2a-3pts), Marhall Everson (2g-1a-3pts), and Connor Gaarder (2g-1a-3pts) all figured in prolific fashion in the Edina scoring as well. Much has been made about the injury to Zach Budish and the Hornets answered with an emphatic yes, that they can and will score. The Hornets (1-0) took a 7-3 lead after the first period. Edina had eight players pick up two points or more onteh game. Buffalo (0-1) were led by Cole Meyer who picked up 2 assists on the night. Hornet goalie Michael Young made 10 saves in the win as the Hornets outshot the Bison 45-14. 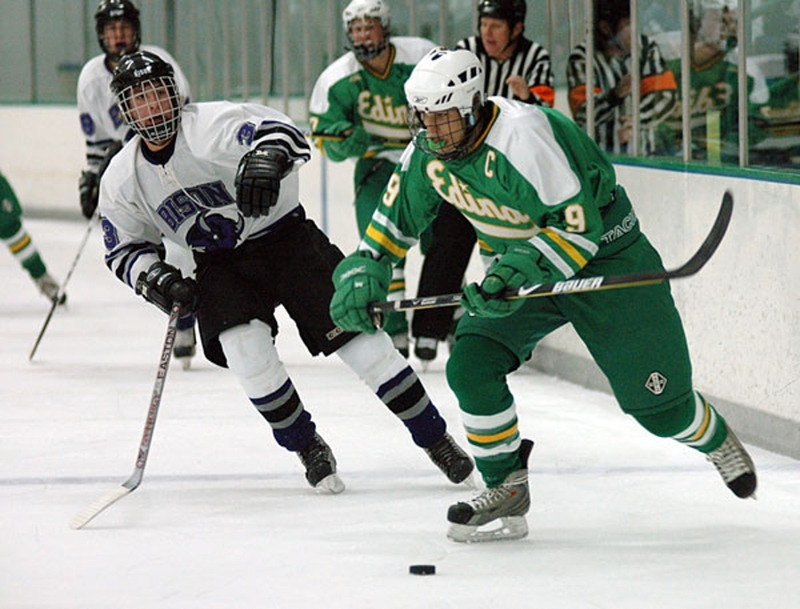 Edina squared off with the Wayzata Trojans on Saturday night and posted a 4-1 victory as The Hornets took a 3-0 lead midway through the third period. They never looked back as sophomore Michael Sit opened the scoring for Curt Giles Horntes. Connor Gaarder, Charlie Taft and Anders Lee scored for the Hornets as Danny Walsh was the lone goal scorer for the Trojans. Junior goalie John Ankeny made his debut in goal for Edina making 15 saves. The Hornets host the Burnsville Blaze who lost their opener in Bloomington to the Jefferson Jaguars by a score of 4-2.